For the past couple weeks, I've been seeing posts and pics all over social media from moms taking their kids to Frozen on Ice. And at the same time, there was another show in town. 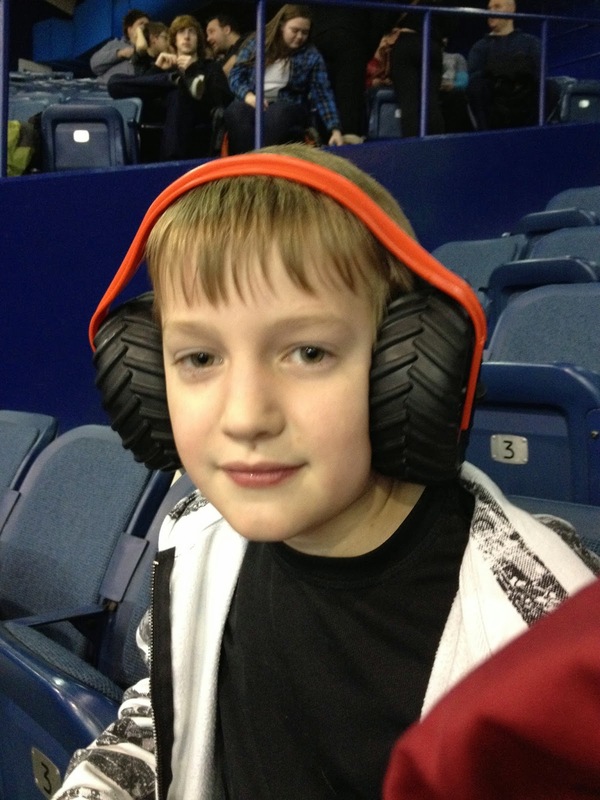 One with big boy appeal...Monster Jam. 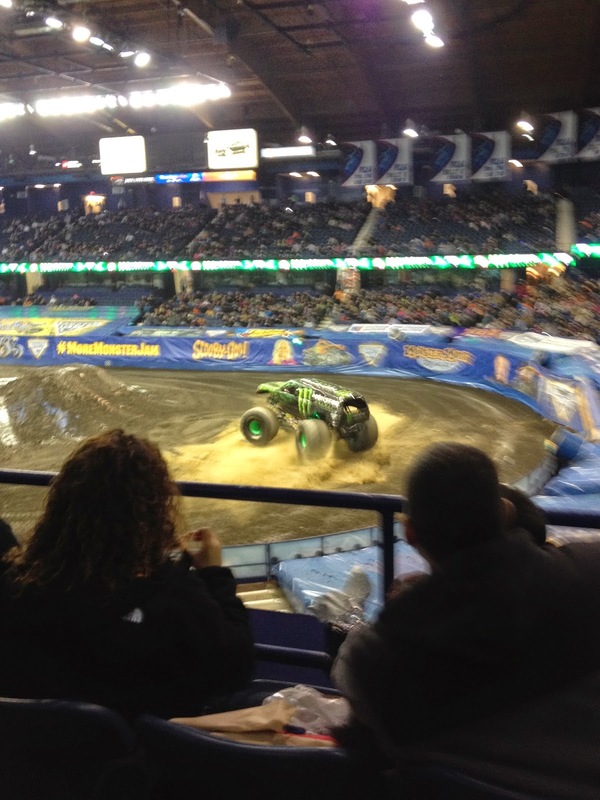 And since I'm a mom of no girls and all boys, I found myself sitting in the loud, smelly, freezing Allstate Arena watching ATVs and dune buggies and big monster trucks make their way around the track lined with dirt and sand. Never in a million years would it be a place I would pick to spend money on tickets for and choose to spend a night at. But, you know, the things we do for our kids. And I did have fun. In my early days of parenting, I thought that one of the best things you could do as a mother was to do things for your child. It's pretty much a necessity at first. You have to do everything for that new child. They are helpless without you and spend those early days wrapped in the neediness of that child and you do everything you can for him or her. As the child grows, the amount of things you do for them should lessen. I really didn't understand the concept that the idea of raising a child was to help them learn to do things on their own and to become independent. You are to raise them to one day be able to do all the things you do for them all on their own. It really is all about doing for them then teaching them and then eventually them not needing you to do those things anymore. I honestly didn't get it at first. I just didn't get it. Why would I make my child do something when I could do it for them? I washed faces after eating. I cut up food for them. I made their beds. I cleaned their clothes. I sorted their socks. I straightened up their rooms. I ran their baths. I cleared their dishes off the table when they were done eating. I was mom. I was supposed to do these things. Looking back, that is really what I was thinking. It seemed mean almost for me to make my child do a chore when I was completely capable of doing it. Well, that was when I had one son and he was the center of my world. Needless to say, my attitude has shifted as more children were born and they grew. My attitude may have changed a little too much. Now my way of thinking is "why would I do something for them that they could do themselves?" If a child sits in front of the television and calls to me in the other room as I am in the middle of a project asking for a beverage, I most likely will reply, "No, you are capable of doing it yourself. You can get yourself a glass of water." Rewind 15 years and I would have jumped no matter what I was in the middle of and delivered that glass of water. And then kissed them on the forehead and probably asked if they'd like a snack to go with it. My mind wandered to such thoughts today as I did laundry. You see, I don't usually do laundry. The kids are all old enough that they are all capable of doing laundry. Hubby washes his uniforms at work. The kids each do their own and there's a chart on the fridge with laundry on the list. Each day one of them is responsible for washing whatever is the laundry room that needs to be washed. Towels. Blankets. Coats. Hats. Gloves. Sheets. Stray socks. Pieces of clothing belonging to their brothers that got left behind in the bathroom hamper. And my laundry and my husbands. I do the folding and put it away, but they fill the washing machine, transfer it to the dryer and carry the baskets upstairs so I can fold them. Then they carry the clothes to wherever they need to go. Laundry is something a child can and should learn to do. I cringe when I hear about mothers who still do laundry for their adult sons. I am glad that I finally woke up and gave this chore to the kids. It's something they are capable of. They learn cause and effect in the way that if they don't do their laundry, they don't have clean clothes. They then have to wear something not so clean or dig into the icky looking or ill fitting pieces that serve only as back-up garments. I want to raise sons who can fend for themselves and not expect that the woman they end up with will be the one doing the laundry and housework and cooking and all that good stuff. I want them to be men who were taken care of my mom and then taught that everything mom did for them they could do on their own.